Tennis fans don’t have far to travel to practice their serves and forehands — Riverstone offers several community tennis courts for resident use. Because the courts are lighted, residents can play at their leisure, catching a late game at the end of the day. 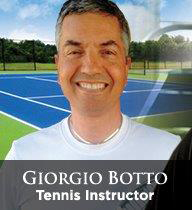 Tennis lessons at Riverstone are provided by Giorgio Botto, a Certified Tennis Professional, who holds a degree from the Professional Tennis Management program at Tyler Junior College. To learn more about Giorgio Botto and what he has to offer Riverstone residents, visit his website here.